Let’s start with two truths about our era that are so inescapable as to have become clichés: We are surrounded by more readily available information than ever before. And a huge percentage of it is inaccurate. Some of the bad info is well-meaning but ignorant. Some of it is deliberately deceptive. All of it is pernicious. With the internet always at our fingertips, what’s a teacher of history to do? Sam Wineburg has answers, beginning with this: We definitely can’t stick to the same old read-the-chapter-answer-the-questions-at-the-back snoozefest we’ve subjected students to for decades. If we want to educate citizens who can sift through the mass of information around them and separate fact from fake, we have to explicitly work to give them the necessary critical thinking tools. 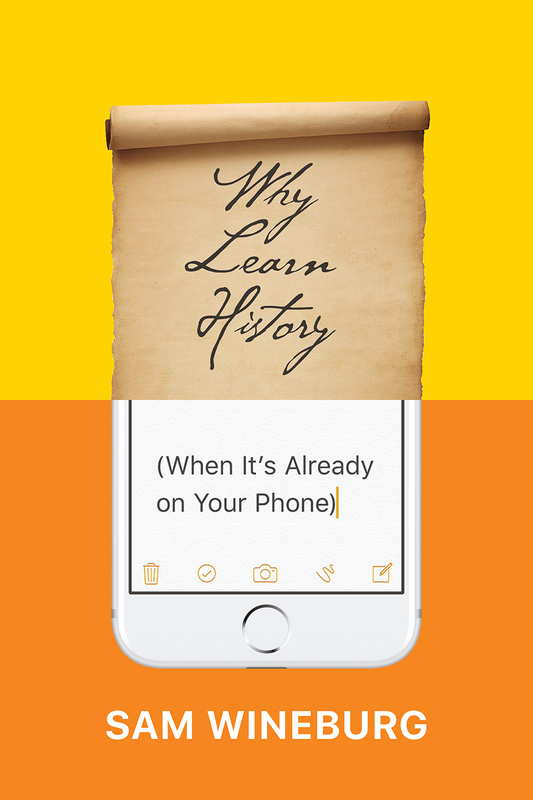 Historical thinking, Wineburg shows us in Why Learn History (When It’s Already on Your Phone), has nothing to do with test prep–style ability to memorize facts. Instead, it’s an orientation to the world that we can cultivate, one that encourages reasoned skepticism, discourages haste, and counters our tendency to confirm our biases. Wineburg draws on surprising discoveries from an array of research and experiments—including surveys of students, recent attempts to update history curricula, and analyses of how historians, students, and even fact checkers approach online sources—to paint a picture of a dangerously mine-filled landscape, but one that, with care, attention, and awareness, we can all learn to navigate. It’s easy to look around at the public consequences of historical ignorance and despair. Wineburg is here to tell us it doesn’t have to be that way. The future of the past may rest on our screens. But its fate rests in our hands. 5 What Did George Think? "Today's students might be 'digital natives,' but that doesn’t make them responsible consumers of digital information. . . . According to Wineburg, the issue is not that students are ignorant of names and dates. In fact, as he points out, even the most accomplished specialists in the discipline could flunk a multiple-choice test on an area of history they are unfamiliar with. It’s more of a tragedy, he argues, that students are made to memorize facts instead of learning the critical-thinking skills that equip their minds to discern context, sniff out biases, and employ reasoned skepticism when evaluating sources. . . . Confronting the reality that even professional historians can make mistakes reading sources on the internet, Why Learn History provides clear advice to history teachers about what they can do to improve digital media literacy." "Sam Wineburg is a true innovator, who has thought more deeply about the relevance of history to the Internet--and vice versa--than any other scholar I know. Anyone interested in the uses and abuses of history today has a duty to read this book." "A sobering and urgent report from the leading expert on how American history is taught in the nation’s schools. Wineburg offers a set of timely and elegant essays on everything from the nuttiness of standardized testing regimes to the problems kids have, in the age of the internet, in knowing what’s true, and what's not--problems that teachers have, too, along with everyone else. A bracing, edifying, and vital book." "If every K-12 teacher of history and social studies read just three chapters of this book--'Crazy for History,' 'Changing History One Classroom at a Time,' and 'Why Google Can’t Save Us'--the ensuing transformation of our populace would save our democracy." "At a time when we are overwhelmed with information and vulnerable to malign influence, Wineburg guides us with deft and provocative writing to not only think better historically but to think better, period. We need this book." "Why Learn History asks basic questions about what we should aim to accomplish in history classes, what it means to foster modes of critical thinking, and how teachers at all levels could do a better job of making history matter. Wineburg convincingly critiques common misdiagnoses and proposed solutions of the discipline’s problems, which usually begin with some list of facts students do not know and then inevitably lead to a narrow focus on improving factual knowledge. He opens up space for a urgently needed discussion of how to teach students not just what historians (and, often, Wikipedia) know, but how historians think--and why historical thinking, even more than historical knowledge, is good for individuals and communities." "Sam Wineburg's groundbreaking work on historical thinking has proven to be a game changer for thousands of history teachers around the world, impacting millions of young people's perspective of the past, the present, and the future. Never one to remain stagnant, his work has been enriched and taken on increasingly new significance in a twenty-first-century world that is overrun with information at our fingertips that may be factual, misinterpreted, fabricated, or contrived. The future of our democracy, and the future of all humankind benefits from this important work." "Historians generally know more about what we teach than about what students learn. Sam Wineburg tells us why that's a problem. We need to listen." "To grasp how children think about and use the internet as they struggle to understand history, you must know how children think. No one is more insightful than Sam Wineburg in explaining how the internet is affecting student learning today, and how it can better fulfill its promise." "A worthwhile investment. Wineburg not only uses a title akin to clickbait, but he also writes in an engaging, dynamic way that helps the reader wade through significant research and data points to arrive at the important conclusion that studying history through a critical lens can help students become more aware of dangerous systems, falsehoods, and ideologies alive in the world around them. . . . Teachers who read Wineburg's book will have a better path towards helping students face today's challenges."